On January 22, 2015, Yemen’s President, Abdu Rabu Mansour Hadi, resigned shortly after his prime minister and Cabinet stepped down. The sudden resignation came only one day after Houthis rebels struck a tentative UN brokered deal with President Hadi aiming to halt days of turmoil. The deal reportedly agreed to a power sharing between the government and, in exchange, Houthis would relinquish control over government facilities seized last September and would release President Hadi’s chief of staff, whom the rebels kidnapped. Nevertheless, President Hadi stated he had to resign so as “to avoid being dragged into an abyss of unconstructive policies based on no law…We don’t want to be a party to what is happening or will happen.” This blog will set forth the concerns arising out of Yemen’s change in political leadership, discuss the role of the UN during Yemen’s time of turmoil, and explain how this change in regime to the Houthis directly affects U.S. counterterrorism in the Arabian Peninsula. The Houthis adhere to the Zaidism branch of Shia Islam as members of Ansar Allah (Partisans of God). Their slogan translates to, “Death to America, death to Israel, curses to the Jews and victory to Islam.” As Shiite Muslims, in a majority Sunni country, Houthis wanted more power and elimination of marginalization. Under international law, it is true that the people of Yemen have the right to self-determination when denied rights amongst the political spectrum, but claiming authority via a coup d’état is not the proper legal method to convene political rights. So, as the Houthis dissolved parliament and announced plans for a new interim assembly and five-member presidential council, they claimed more than they bargained for – the responsibility to govern. Conversely, Sunni and southern leaders will, most likely, not recognize their assertion to power, thus intensifying the country’s descent into chaos. UN Secretary General Ban Ki-moon urged Yemen to reinstate President Hadi and told Council, “Let me be clear, Yemen is collapsing before our eyes. We cannot stand by and watch.” It is the job of the UN Security Council to act in accordance with Chapter VII of the UN Charter (Action with Respect to the Threats to the Peace, Breaches of the Peace, and Acts of Aggression) during this time of hostility and take measures to promote peacekeeping. Due to safety concerns, the U.S. even closed the American embassy in Yemen, placing it in similar circles as Syria and Libya where U.S. diplomatic presence has been removed. Similarly, other states have closed their embassies due to security concerns. Yemen is a fractured country on the brink of a civil war and the recent struggle for power also generates opportunity for al-Qaeda to establish a stronger foothold. For a long time Yemen’s government has been considered a key ally in the fight against al-Qaeda in the Arab Peninsula (AQAP). Houthis claim to be anti-al-Qaeda and have driven the extremists from the areas they control, but Saleh Ali al-Sammad, second in command for the Houthis rebel group and former advisor to President Hadi, alludes to other conclusions by stating, “We are not against the missions or individuals themselves, but against policies adopted by America.” A common disdain for American diplomacy means the U.S. lacks a key counterterrorism ally in the region while al-Qaeda’s influence expands. 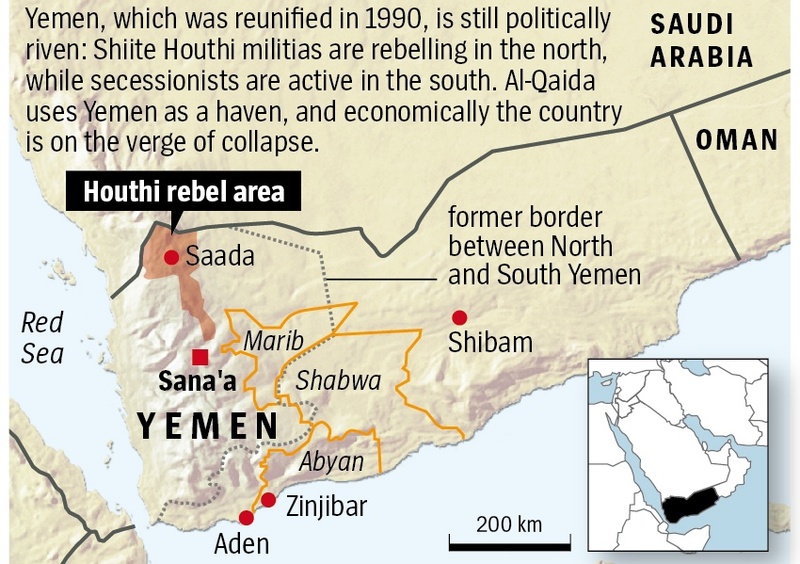 The effective boost for al-Qaeda was affirmed when al-Qaeda fighters completely captured the Yemeni National Army’s 19th Brigade, an important oil-producing area in southeastern Yemen. The strategic position of Yemen next to Saudi Arabia, a top oil exporter, and its access to shipping lanes in the Gulf of Aden make the stability of the country a U.S. priority. Also, Saudi Arabia, as the main Sunni power, believes the Houthis are backed militarily, financially and politically by its Shia regional archrival, Iran, although these allegations have been denied. The international community, especially the UN, must coordinate a response to Houthis’ newfound control and aim to terminate AQAP’s influence in the Arabian Peninsula. Bruce Riedel, senior fellow at the Brookings Institute stated, “Yemen was supposed to be a role model for this smarter approach of building local capacity and getting our allies to do more. It’s a sobering reality that it’s not working.” With the Houthis in power, Yemen, a dominant player in an especially geo-strategic location, is now a pro-Iranian, anti-American Shia militia. 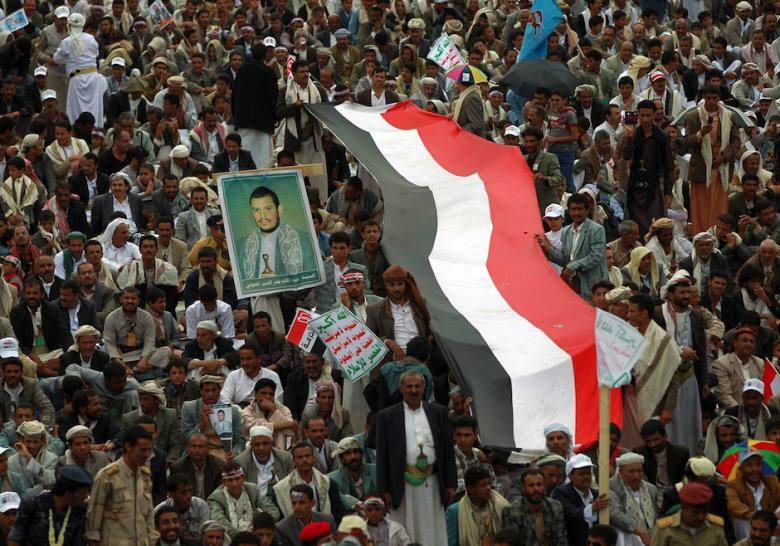 The Houthis’ rebellion has not only put Yemen at a political crossroad that concerns the international community, but has now also caused the U.S. to reevaluate its commitment to the poorest country in the Arabian peninsula as al-Qaeda’s infectious presence intensifies. Nick Paton, Yemen’s President, Cabinet Resign, CNN (Jan. 23, 2015), http://www.cnn.com/2015/01/22/world/yemen-violence/. Nadia Prupis, Yemeni President, Cabinet Resign Amid Deal with Rebels, Common Dreams (Jan. 22, 2015), http://www.commondreams.org/news/2015/01/22/yemeni-president-cabinet-resign-amid-deal-rebels. Nick Paton, supra note 1. Nadia Prupis, supra note 3. 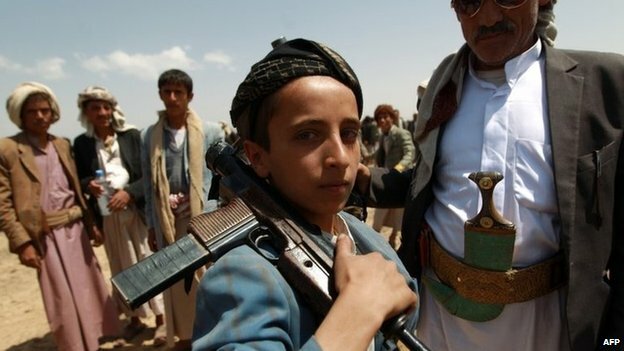 Yemen Crisis: Who are the Houthis?, BBC News Middle East (Feb. 6, 2015), http://www.bbc.com/news/world-middle-east-29319423. Yemen Crisis: Who are the Houthis?, supra note 6. Shuaib Almosawa & Rod Nordland, Qaeda Fighters Gain in Yemen as United Nations Warn of Country’s Freefall, N.Y. Times (Feb. 12, 2015), http://www.nytimes.com/2015/02/13/world/middleeast/al-qaeda-yemen-military.html. Shuaib Almosawa & Rod Nordland, U.S. Embassy Shuts in Yemen, Even as Militant Leader Reaches Out, N.Y. Times (Feb. 10, 2015), http://www.nytimes.com/2015/02/11/world/middleeast/yemen-houthi-leader-pledges-to-pursue-power-sharing-accord.html?_r=0. Shuaib Almosawa & Rod Nordland, supra note 11. Shuaib Almosawa & Rod Nordland, supra note 10. Bruce Ridel, supra note 7. Categories: international law | Tags: Al Qaeda, counterterrorism, coup, coup d'etat, houthis, non-international armed conflict, UN Charter, United Nations, United States, Yemen | Permalink.